I finally made it to Borneo! I decided to check out the part of the island that belongs to Malaysia and skip the 21-day cross-Borneo trek through river and jungle in Kalimantan, the part that belongs to Indonesia. It still sounds very fun to me but I am not sure I would be able to survive the jungle for that long, dealing with the muddy trails, the over-whelming humidity and the leeches, plus it can be expensive if I don’t find a group to join. Ooohhh! but it still sounds so exciting and amazing that I will have to revisit this idea later when I return to S.E. Asia in January! So what fears did I face if I didn’t cross the jungle, you may ask… my fear of water! most specifically of deep water with currents. I have always had a strange fear of water ever since I was a little girl. I remember crying in my dad’s arms as he was trying to bring me into the pool at my grandparents’ place. I was terrified! I always thought that he would let go of me and I would immediately sink to the bottom and drown. How did I develop such catastrophic thinking at this young age…perhaps I drowned in a past life?! I didn’t learn to float, or rather accept the fact that my body could float in water, until I was nine years old. My closest cousins were national swimming champions in Colombia so naturally my mom thought that my sister and I could be like them so she enrolled us in swimming classes. I failed the course because I refused to get in the water. Every Saturday morning, I would sit by the side of the pool watching the other kids learn the different swimming styles as I rested there terrified, embarrassed, and feeling worthless because I couldn’t be like them. Finally one day I built enough courage to get in the water and let my body float. I stayed very close to the edge and made sure to have one hand ready to grab on to it in case my body didn’t stay up, but to my surprise, it did! That was one of the happiest days of my life, and not necessarily because I learned to float in water, but because I learned about COURAGE. Wikipedia defines Courage as the choice and willingness to confront agony, pain, danger, uncertainty or intimidation. I definitely felt very courageous as I decided to take action in facing my fear. Unfortunately I didn’t pass the course that morning. I actually failed it a second time and finally passed it on the third try. I have continued to face this fear of water throughout my life. I keep myself “courageous” by trying different aquatic activities. I have gone on numerous rafting trips, I have swam in many lakes/rivers during camping trips, I have snorkeled in every sea/ocean that I visited during my travels, and about a year ago, I started trying canyoneering. Canyoneering consists of exploring canyons; which sometimes involves wading through water, jumping into deep water, and rappelling in waterfalls. I am fine with the wading but I am still working on the jumps and waterfalls. Every time I put myself out there (in the water), the fear decreases because I learn more about myself and what I can handle. What I have learned about Fear is that most of the time it exists in our minds because we are ignorant about something, in other words, we are usually afraid of what we don’t know. And the best medicine for ignorance is to get educated. So the more I learn about being in the water, the more the fear decreases. Sometimes I have gone a bit overboard in trying things that may be considered crazy, even for someone who is not at all afraid of water. For example, I went on a full-day rafting trip of the Zambezi in Zambia. This river is considered to be one of the most dangerous in the world. I didn’t want to be the only one in my group that didn’t do it. I certainly did not want to hear about what I had missed afterwards from my friends. And I could not live with that terrible feeling of “I wish I would’ve done it”. The rafting was a total of twenty one rapids, some were rated class 5, and others class 4. I flew out of the raft as we went through rapid seven and our raft flipped in rapid eight. It was crazy, scary, and fun at the same time. I can say with certainty that I will never raft the Zambezi again but I am glad I did it then. It taught me once again that I am stronger and braver than I think. I am now onto my next big challenge in the water; which is learning to scuba dive. The thought of being under-water and having my life depend on a regulator is still very intimidating, but because I am one to face my fears, I am adamant about becoming a certified open-water scuba diver. I actually took the open water certification course about fifteen years ago in Colorado. I passed the theoretical part with flying colors. I completed all of the skills in the water but I had a very hard time with the one where you take off your mask and put it back on, all while being at least 6 feet under water. The first time I tried it, I quickly pulled the mask off without giving much thought to what was about to happen- all of the water rushing into my nose. I panicked and let go of the regulator and swallowed half of the pool before quickly shooting up to the surface. I remember my instructor being very upset with me. At the time the only thought that went through my head was “why would anyone in their right mind want to take their mask off in the ocean? !” ha! this is actually one of the most important skills to learn. It is very rare that your mask will come off during a dive but it is important to know how it feels and how to react if it ever does. I eventually passed all my skills in the pool but unfortunately I could not fathom the idea of repeating the mask exercise in the ocean. Sadly, I let the validity of the course expire and never completed the open water evaluation. My recent trip to Semporna in the region of Sabah in Borneo provided me with an opportunity to face this fear again. I didn’t actually get certified in Borneo but I tried a “discovery dive” that got me a step closer to reaching my goal. A “discovery dive” is where you dive with an instructor who keeps a very close eye on you. The instructor teaches you a few basic safety skills that you have to do in the water before getting on with the dive. You are not allowed to go deeper than 12 meters (40ft). When you have your open water certification, you can go as deep as 18 meters (60 ft). I did two dives in Mabul, one of the three islands in the archipelago of Semporna. I have actually done six discovery dives in my life, two in Australia fifteeen years ago, two in Bali two months ago and now two in Malaysia. I’d say that’s enough “discovering” for now! Next time I am going for the certification! The discovery dives in Mabul were pretty spectacular. I saw so many schools of fish and a giant turtle and thought that if Mabul had this much to offer then I wanted to see Sipadan! I was supposed to leave Semporna after completing the discovery dive but luckily I was able to secure a permit to visit Sipadan three days later. Sipadan visits are managed through a permit system. The island and the marine park around the island are protected and they only allow about 120 people per day. I had to book a package with a guesthouse in Mabul that had the permit as there are no accomodations in Sipadan. While I waited for my Sipadan day to come, I snorkeled around Mabul and Kapalai. I was the only “full-time” snorkeler at this guesthouse, everyone else was there to dive. I felt a bit weird at first, being the only one there not certified in diving, but I decided to ignore it and just enjoy my time. It was actually great to be surrounded by divers as their passion for the sport quickly rubbed off on me. It was also part of my strategy to surround myself with people that I considered more knowledgeable and braver than me on the subject. Everyday I went out on the boat with them, sometimes one or two people would join me for snorkeling. To my surprise I saw more marine life than the divers in Kapalai. In Sipadan we all saw a lot of fish and turtles but the divers saw a school of sharks up close and I only got to see one from afar. This is definitely another incentive to get certified- to see big fish! I made a lot of progress in facing my fear of water during this trip. In these three days I learned to (free) dive deeper than I had ever gone before. I was feeling comfortable enough to even film the fish with my gopro. Here is a link to a video I made; which is a bit long (sorry) but it shows lots of fish. It has some parts from my discovery dive in Mabul, as well as the snorkeling in Kapalai and Sipadan. I highly recommend going to Semporna, it is absolutely beautiful and full of marine life. I saw the common lion fish, harlequin sweetlips, blue spotted ribbon tail ray, turtles, a snake, a giant moray eel, schools of jack fish, trigger fish, cuttlefish, striped surgeon, trumpet fish, pufferfish, a white tip shark and barracudas among many, many, many others. A side story about Mabul… they get a lot of Filipino moro migrants from Mindanao and the Sulu archipelago that have been coming to Sabah since the 70’s and have settled illegally on the island, as well as other places in Sabah. Unfortunately they have created a lot of social problems for the region- theft, vandalism and pollution of the island and the sea. There have also been incidents of kidnappings of tourists and fish farmers for ransom, and raids and attacks by the Abu Sayyaf militants. Night dives are prohibited in the archipelago and you find heavily armed guards at the guesthouses and resorts who are on watch every night. We had some of these guys at our guesthouse keeping watch over us every night. Borneo is beautiful in and out of the water. I visited the city of Kuching in the Serawak region on the Western part of the island. This city was a great launch point to begin my quest to see wildlife. Before seeking animals, I took the opportunity to join a nice couple Martha and Rob from Belgium to do a trip up the Lemanak river by canoe to stay a couple of nights in an Iban longhouse. 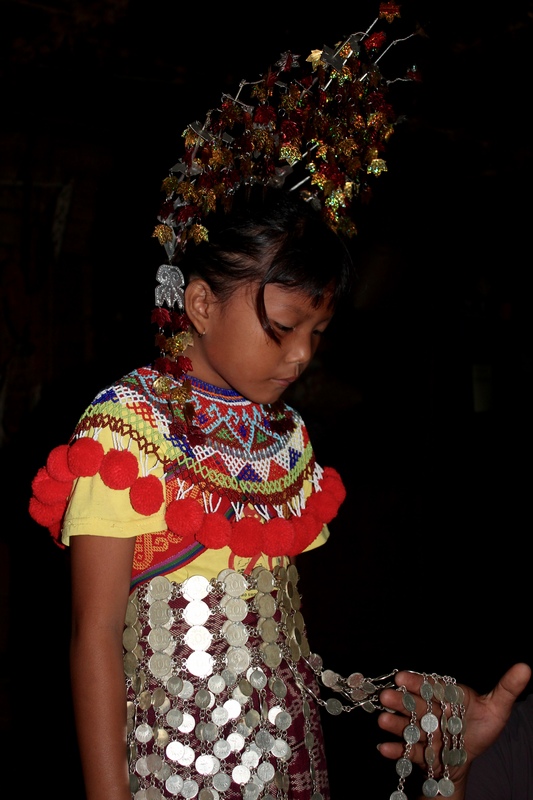 Sarawak is dominated by two tribal groups, the Iban and the Bidayuh. These groups have a strong connection to the forest and they grow rice and fruits, hunt and fish. 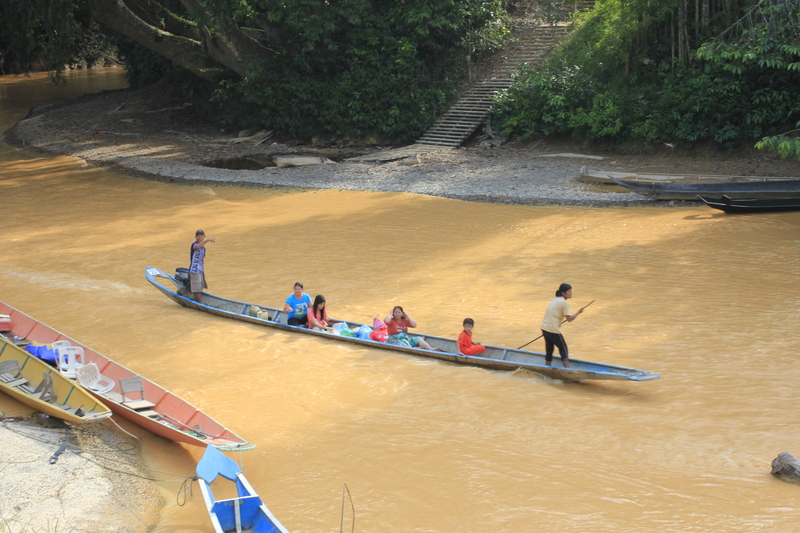 The Iban live in longhouses along the main rivers where many families lead a communal life under one common roof with one elected Chief who makes all of the important decisions. The Iban are famous for their “Tuak” or rice whiskey; which they served us as soon as we arrived and we had to drink before even entering the house. 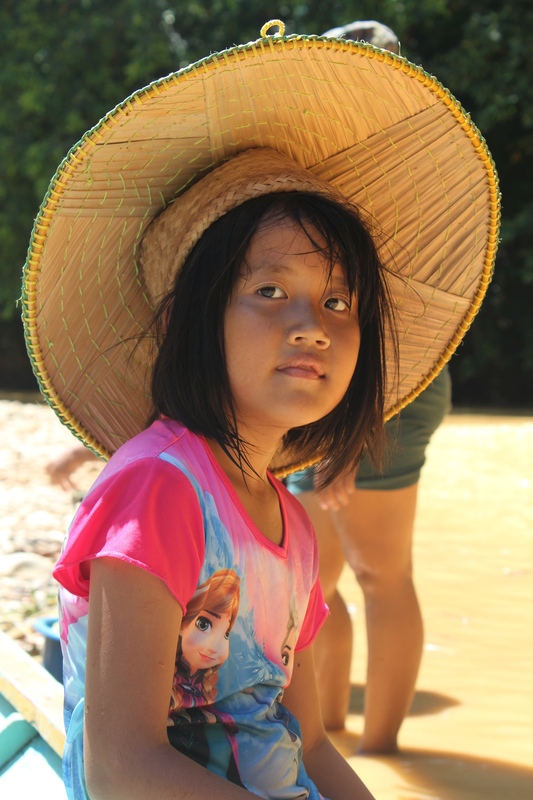 Although the Iban still maintain their heritage and traditions, they also enjoy modern amenities like having a television; which is offered free of charge by the government and cable service; which is provided at a very low monthly rate. They use generators for electricity; which is turned on every night so the families can cook and the children can watch TV and/or sing karaoke. Each family makes their own income by taking turns welcoming and cooking for the tourists and selling crafts that they make and/or buy at local markets. The men dress in modern civilian clothes (t-shirts and pants) while most of the women wear sarongs. The Longhouse we visited was made up of 37 families who stay in their own “bilek” or separate unit inside the Longhouse. All the bileks are separated by simple partitions and they all share one long common corridor or hall where they do common activities. During the day you find women weaving hats and baskets out of straw, drying pepper or rocking their babies to sleep in small hamacs. The tourist visitors spend the night in the hall on provided mattresses with mosquito nets. They also have “western” toilets and showers outside of the Longhouse for tourists to use. We were given a tour of various family units and invited to watch the women prepare our dinner while they passed some more Tuak around. After dinner, some of the younger members of the tribe performed their celebratory dances for us wearing the traditional Iban costumes. During our stay they also taught us to use the blowpipe; which the men use for hunting animals and hunting their enemies in past warfare. It is customary for visitors to present the Chief with gifts to be distributed to all the families. We brought them salt, crackers and other processed foods wrapped in individual packets. The mothers from each of the 37 families came together and waited patiently as the Chief placed the gifts equitably into their baskets. One of the highlights was having a barbeque by the river with the Chief and others and seeing how they cook meat and vegetables inside bamboo. Rob and Martha, the nicest couple from Belgium! The tide was low so the long boat would get stuck often. The Chief and his helper had to get out to pull the canoe. Babies are put to sleep in hammocks attached to the ceiling by springs. I took another river cruise in the Kuching Wetlands National Park where we got to see the majestic mangroves, dolphins, silver leaf monkeys, long tail macaques, the king fisher bird, a baby crocodile and a gigantic crocodile run into the water in the dark. We got to witness a spectacular sunset and hear the mosque from the near-by fishing village announcing prayer time and the breaking of fast during Ramadan. Prior to going to the Iban Longhouse, we visited Semenggoh Nature Reserve where they have an Orangutan Rehabilitation Center. They rescue Orangutans from families that keep them as pets, educate them to survive in the wild and eventually release them. The orangutans come back to the center during feeding times if they can’t find any fruit in the forest on their own. 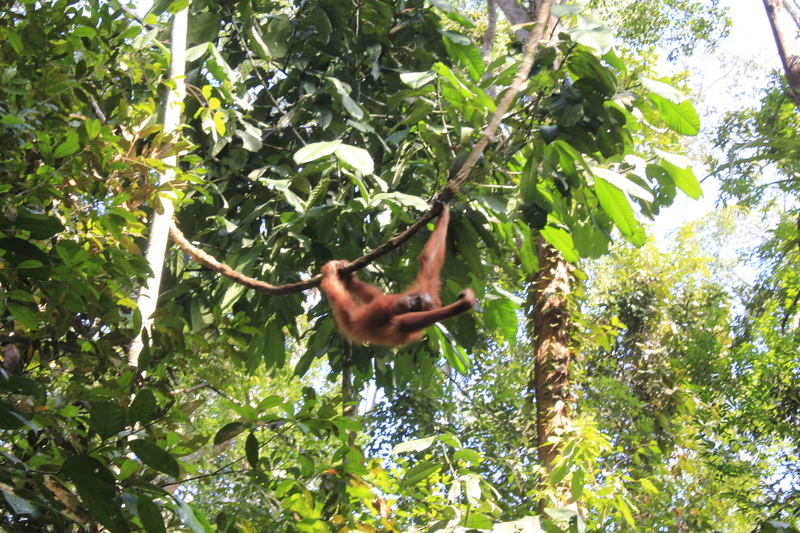 We watched from an area located about 10 meters from the feeding platforms where the Orangutans showed up. We were lucky on this particular morning as seven orangutans came to the center to feed, sometimes none show up at all. It was incredible to watch them meander through the forest and swing from vine to vine above us. Some of them actually came on the walking trail and got very close to us. There is one in particular that is known to be aggressive and suspected of mistreatment during its captivity- Ritchie. We got to see him up close and he was huge and very intimidating! Orangutans are solitary animals, you always see them in the wild alone unless you see mothers with babies or couples mating. During my stay in Kuching, I took a local bus and a ferry to reach Bako National Park; which was only 37 km away from the city. 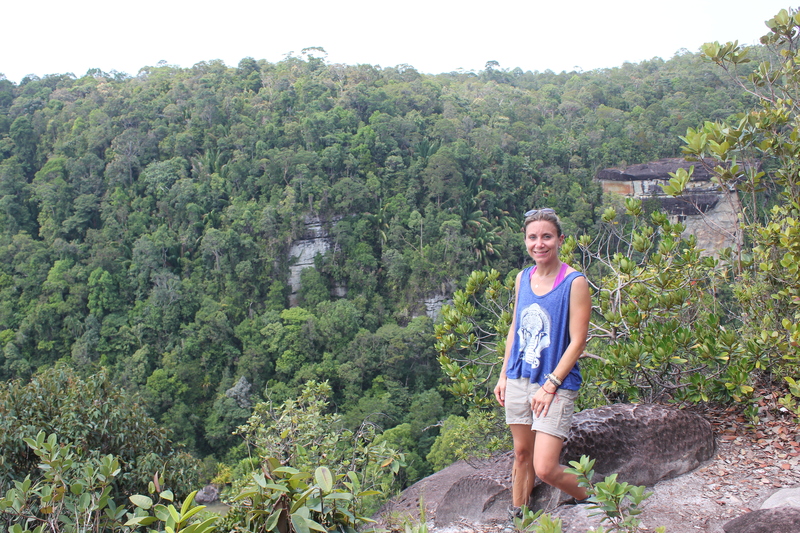 It felt like a world away as we reached a beautiful and dense rainforest full of wildlife. I met a nice family from Spain who invited me to do a couple of hikes with them. We saw the famous proboscis monkeys and went for a swim in one of the beaches. While coming down from the mountain it started pouring; which made it even more special, rain in the rainforest! For more wildlife viewings, I went to Sandakar. 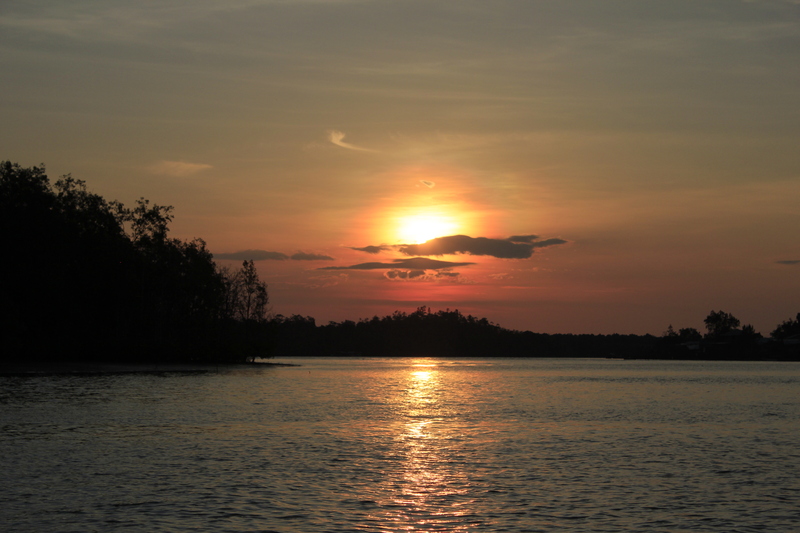 The muslim city of Sandakar was the launching point for a wildlife cruise in the Kinabatangan River. We were there during the last day of Ramadan. Families celebrated and walked around town dressed in the same color. Everyone was wearing colorful and silky outfits. I joined a nice couple from Germany and Italy to go on a three-day trip to cruise the Kinabatangan and stay in one of the many lodges set up along the river banks. After passing gigantic plantations of palm oil we finally reached the small piece of dense forest that is still left in Sabah. The Kinabatangan is the longest river in Sabah and the forest around it is full of wildlife driven here by the deforestation caused by the huge plantations. We met the rest of our group and enjoyed a few early morning and afternoon cruises and afternoon and night jungle walks where we go to see the rhino hornbill, egrets, crocodiles, long and short tail macquaques, tons of proboscis monkeys, storks and during our night walks a lot of different insects, a civet and an owl. One of the highlights of this trip was seeing a high number of the Borneo endemic proboscis monkeys. They are very interesting looking monkeys with long noses. They look like grumpy old men as they sit on branches, hunched over, with their arms up on their bent legs and their giant bellies popping out (they have two stomachs). Mr. Orangutan, a lucky sighting in the wild! Love your posts! The video is great! I’m glad you are having the opportunity not just to explore and learn from other cultures but to growth as a person even more! Thanks for keeping us seeing the world through your eyes! gracias Dan! it is a bit difficult to open up to the public about my fears but it is pretty freeing to be able to talk about it. 🙂 Thanks for reading and I hope you join me later! I’m so impressed with your entries and travels. You are so knowledgeable! It’s so great to see all of these places and hear about the people and culture. Thank you so much for opening yourself up and giving us such an honest experience. It’s absolutely wonderful watching you on this journey.